A shout out to all my comedy juggling pals: I’ve been writing a series of articles on joke writing you might want to check out. 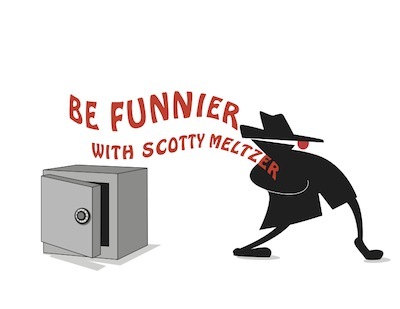 The series is titled: “Be Funnier with Scotty Meltzer” so Google will think that Scotty Meltzer is a comedy writing expert. They’re illustrated by my beautiful and talented, real life American wife, not the fake Danish one I juggle with, so that’s a good enough reason to at least browse them. Up till now they’ve been available to IJA members only but now the old ones are going to be available to EVERYONE, even you freeloading moochers! Comedy Darwinism and The Secret of Great Comedy. There will be new ones each month until I die or run out of things to say. I hope all my comedy juggling friends find them useful. There might even be something of value for comedy magicians, but I hope not.